Are you looking for a fun filled South Walton, Fl vacation? The Village of South Walton is the perfect place! This resort offers 1,2, and 3 bedroom fully equipped condo’s for your stay at the beach. The community offers a pool and laundry facilities for your stay. Enjoy countless local restaurant and shops. Enjoy biking on the local bike trails or one of the many local parks. Some of the local favorite restaurants include Edward’s Fine Food & Wine, Crabby Steves Highpointe and Pizza by the Sea. When your ready to head to the beach, don’t worry as there is tram service to provide you with a ride. 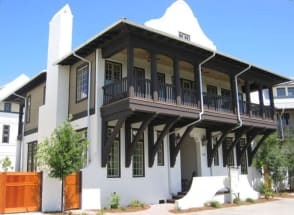 If you do not feel like riding, Rosemary beach is only a short walk. The Village of South Walton is a great place to spend your family vacation. Plan your stay at the Village of South Walton in Florida with Emerald Coast By Owner. Booking with ECBYO.com will assure you are put in direct contact with the property owner and will not pay any booking fees. We hope you enjoy your stay on the Emerald Coast at The Village of South Walton!